New Mexicans donated only a little more than $11,000 to Donald Trump’s campaign in May. 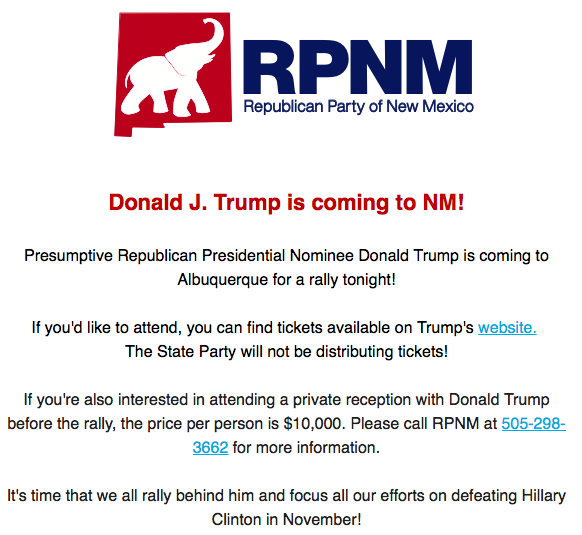 And it’s unclear who donated how much – if anything – at a publicized $10,000 per person fundraiser with the presumptive GOP presidential nominee in conjunction with his May 24 Albuquerque rally. Two joint fundraising committees affiliated with the RNC and Trump’s campaign won’t file reports until July 15. It’s possible those committees haven’t distributed money to the Trump campaign or the Republican National Committee, which must file monthly reports. Trump’s sluggish fundraising in New Mexico mirrors his lagging fundraising nationally, which triggered a wave of negative media accounts. The Republican candidate ended the month with only $1.3 million in the bank, compared with $41 million for presumptive Democratic nominee Hillary Clinton. New Mexico Republican Party spokesman W. Tucker Keene said $5,400 of each $10,000 contribution at the May fundraiser was to go to the Trump campaign – $2,700 for the primary elections and $2,700 for the general election. The state party sent several emails about the rally and fundraiser to supporters, but Keene said none of the money went to the state party. But a report filed with the Federal Elections Commission by the Trump campaign on Monday shows only 20 donations of $2,700 to the Trump campaign from May 24 through May 27. None of them are from New Mexico. And a statement on Trump’s website Tuesday said the campaign held its first fundraiser on May 25. The New Mexico GOP’s Keene said $4,300 of each $10,000 contribution was to go to various Republican Party committees. But the primary Republican National Committee account filing from Monday shows only one large donation from New Mexico the day of the Trump rally or in the few days following. H. Clark Ford, of Roswell, donated $1,500 to the RNC on May 27. Earlier in the month, Russell Platt, of Santa Fe, of Forum Partners donated $15,000 to the party on May 5 and Philip Reinig, of Los Alamos Technical Associates donated $1,100 on May 17. None of the three men appear on Trump’s donor list. But Mobley, who owns Mo-Te Drilling Co., said he didn’t attend the fundraiser and didn’t know anyone who did. “I would try contacting the Trump campaign and see what they have to say,” he added. 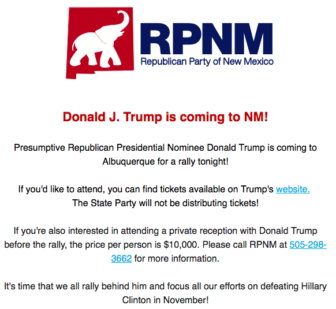 New Mexico In Depth sent an email to Hope Hicks, the Trump campaign’s spokeswoman, asking about the fundraiser. NMID will update this article when we receive a response. Kevin Daniels, of Albuquerque, was identified in news accounts as a host of the May event. He didn’t return phone calls from New Mexico In Depth. He isn’t listed among Trump’s donors, nor is he listed in the RNC’s May report as a donor. Trump has raised a total of $25,282 from New Mexicans since his campaign began, lagging six other former GOP presidential candidates. Democrat Hillary Clinton took a narrow fundraising lead among New Mexico donors over challenger Bernie Sanders, according to May reports. Clinton raised nearly $170,000 from New Mexicans in May, compared with about $115,000 for Sanders. The two Democrats have raised a combined total of more than $2 million from New Mexico donors, compared with more than $861,000 for all the Republican candidates combined. Update: The spelling of W. Tucker Keene’s name has been corrected. The developer of the controversial Santolina development in western Bernalillo County poured nearly $36,500 in June into a political action committee funded primarily by Arizonans. The PAC, now shut down, was created in part to keep vocal opponent Adrian Pedroza from winning the District 2 Bernalillo County Commission primary race.